Nikon has revealed its latest range of compact cameras, adding a whole heap of snappers to its Coolpix range. Among the additions to is the P300, a compact with full manual mode that boasts impressive low-light capabilities. With a 24mm lens and 4.2 optical zoom, the P300 has a 12.2MP sensor. The CMOS sensor means full HD video capture at 1080p and it offers up to 120fps high speed shooting. The P300 (below) will be with us on its UK release date of 3 March, yours for a UK price of £299.99. The S9100 is an impressive wee camera, which manages to pack 18x optical, zoom into a body just a little bigger than the average compact. It's all thanks to the Nikkor wide-angle lens. The camera is also rocking the back-lit CMOS sensor so you can get your full HD video kicks and watch them back on the 3-inch hi-res LCD screen. 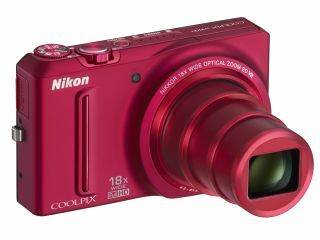 Available in red, silver and black, the Nikon Coolpix S9100 has a UK release date of 17 March and UK pricing will be £299.99. Also announced were the S2500, a £100 point-and-shoot with a 12MP sensor and photo enhancement tools like smile timer and skin softening and the Coolpix L23, a low-cost snapper for the beginner photographer with a UK price of £69.99. Last but not least, Nikon has revealed the three new Coolpix Style cameras, the S3100, S4100 (pictured) and S6100. The three little snappers come with 14 and 16MP sensors, touchscreens and are available in a dazzling array of colours. They'll come with UK prices of between £129.99 and £199.99 when released later this month.